The wine-growing region of the Savoy is small and only 30% of the planted grapes are red, which makes the red wine from this region a real rarity. The most important traditional red grape from the alpine valleys of the Savoy is the Mondeuse. It grows well on the barren soils and produces intensely colored and powerful red wines that embody a stylistic mixture between the structure of Piedmont and the fragrance of the Beaujolais. Moreover, these wines are also very ageworthy from the hands of an expert winemaker like Adrien Berlioz. 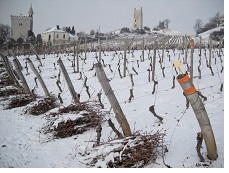 Due to the small quantities, the wines are often quickly out of stock.